Today I’m hosting an event for the ICAEW on the UN Sustainable Development Goals. In preparation, we surveyed the thoughts of attendees as well as their more senior counterparts. What emerged will not surprise anyone who has tracked headlines about millennials, unless you thought — not unreasonably perhaps — that those headlines were just so much nonsense. To summarise the findings, the respondents want something different out of employment. They are focused on social good as well as financial gain — not just for themselves but for their organisations. They want their work to mean something. There’s an argument that every generation has these views at this point in their development. Try replacing ‘millennials’ in any headline with ‘young people’ and you’ll see that most of these headlines could have been produced at any time since the invention of the printing press. But though small, the sample of people we surveyed is not made up of youthful idealists. These are people who are few years into work. Old enough to clarify their ideals through the lens of experience. It does appear that amongst some audiences at least, there is a strong desire for employment that does more than pay the rent. Work that engages as well as rewards. They may get their wish. Though they may find the pay positively disappointing. One of the big challenges of the near future is not so much a lack of work but a lack of work that offers big financial rewards. The ideal solution is that we start to pay the vital but undervalued jobs appropriately. Unfortunately, that isn’t going to happen overnight. ugh campaigning to revalue underpaid jobs in the existing system, or will it be to reinvent the system? In a separate session I was hosting yesterday with Enfield Council on the increasingly digital relationship between city and citizen, there was general acknowledgement that the very nature of public services is likely to change, with an increasing focus on independent, community-led services. There’s a clear opportunity for social entrepreneurship to start to pick up the slack left by austerity. I’m not suggesting this is necessarily desirable, but it will be necessary. 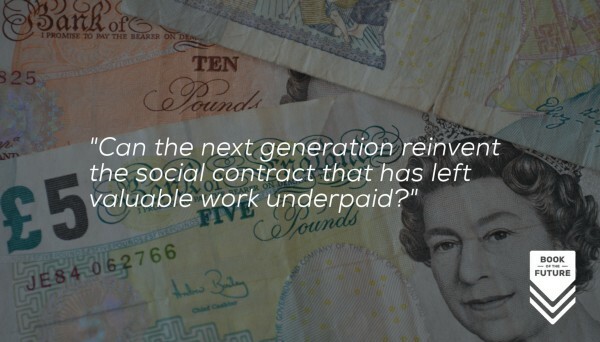 Perhaps through this social entrepreneurship the next generation can reinvent the contract that has left valuable jobs underpaid. And in doing so create careers that are both reasonably paid, and properly rewarding.